A drone which can avoid collisions with obstacles by swerving out of the way has been shown off at the world’s biggest electronics show. 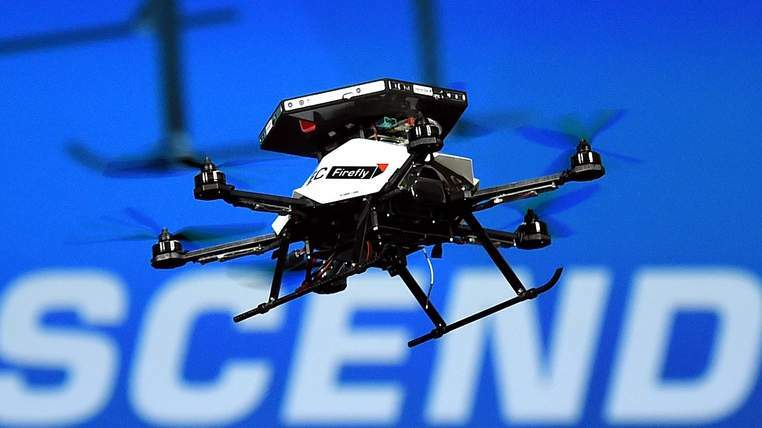 At the Consumer Electronics Show in Las Vegas, Intel demonstrated a drone fitted with RealSense cameras by launching it, then getting representatives to lunge at it to show its dodging capabilities. Chief executive Brian Krzanich detailed his vision for “computing in the third dimension”, featuring intelligent doorways and a tiny chip which can be used for wearable devices. The door locking system works by identifying those with authorised access using facial recognition, fingerprints, or the proximity of a specific smart phone. Intel also unveiled a tiny system-on-chip called Curie, which is the size of a button. It is specifically designed to power wearable devices, and has already been incorporated into a sight-assisting jacket which can guide those with visual impairments. Mr Krzanich has also announced that his firm is teaming up with sunglasses maker Oakley to create “intelligent” eyewear to help athletes, and a wrist-mounted flying camera which can take selfies. Other highlights of CES so far include a Wi-Fi controlled coffee maker that can be programmed using a smart phone, super-high-resolution television sets and the latest in driverless cars.